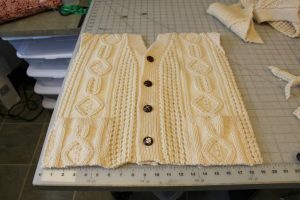 How embarrassing is it for a knitter and sewist to share these photos? This sweater was purchased in Ireland by my father-in-law and I have worn it for years. It was better than a robe – the first thing I’d slip on in the morning to keep me cozy in our 60 degree house. (Then I raise the temp on the thermostat.) It was my in-house uniform. Not only had the elbows worn thin, but it was really falling apart at some of the seams. I’m sure I could have sewn on some leather patches and repaired the breaks. But my daughter bought me another lovely Irish sweater and I decided to retire this sweater. I didn’t like how the buttons pulled, so I wanted to avoid that problem. I thought I’d create a simple tutorial on how to create one. 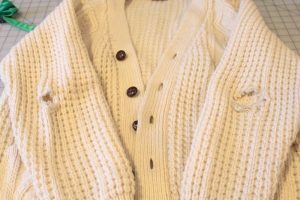 old sweater – cardigans make this project super simple! 1. Cut back fabric. 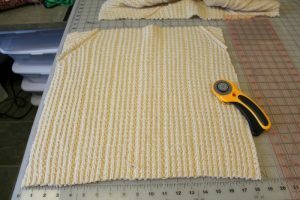 Starting with the back, cut a square 1″ larger than your pillow form. I cut a 19″ square for what I thought was an 18″ pillow form. 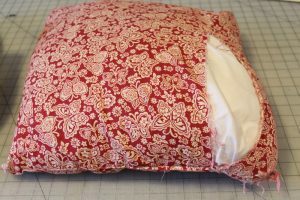 In the end, I took out an inch of fabric, so I am not sure if my pillow form was smaller/worn down a bit or if my fabric was stretchier. But it’s better to start bigger rather than end up with one that is too tight, like my original. The original one shown above was also slightly felted, so it did not have much stretch. 3. Use a piece of the sleeve, if necessary, to fill in the gap. 4. Stitch along the V using a zig zag stitch. 5. Trim away excess fabric on the back of the V.
6. Pin, right sides together. 7. Stitch and turn. Easy Peasy! In theory, that’s how this was supposed to go. 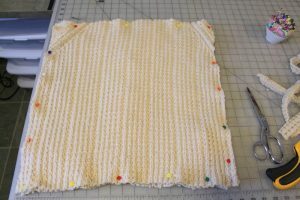 I thought I could simply serge the edges, but my serger did not like the thickness of the sometimes three layers of knitting. I did fight and force it through, probably not a great idea. However, my Janome sewing machine is in the shop and I was really itching to make this. When I found some gaps, I took it up to the loft to sew it using a straight stitch on Annie’s Singer. It stitched through the layers just fine. If you have a serger, I would recommend serging the edges first and then using a regular machine to stitch around the square. 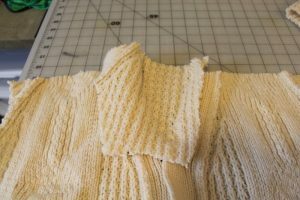 If you don’t have a serger, simply stitch using a straight stitch and then zig zag around the edges just to prevent any of the stitches from unraveling. Turn inside out, add the pillow form and button it up! At least THAT part was easy! I love these. I’m just not ready to give up my beautiful, ill-fitting sweater yet…happy new year! Great idea. Makes me feel warm 🙂 Happy new year! Really like this idea, I have some sweaters that where given to me as gifts but there seasonal so I do not get to use them much. What a cute way to use them so they can be out and enjoyed more by me and others. Thank you for this lovely idea. and don’t apologies for a tatty cardy and pillow ,you know what they say about a mechanics car, it’s always the last to get worked on cause he’s to busy helping everyone else. 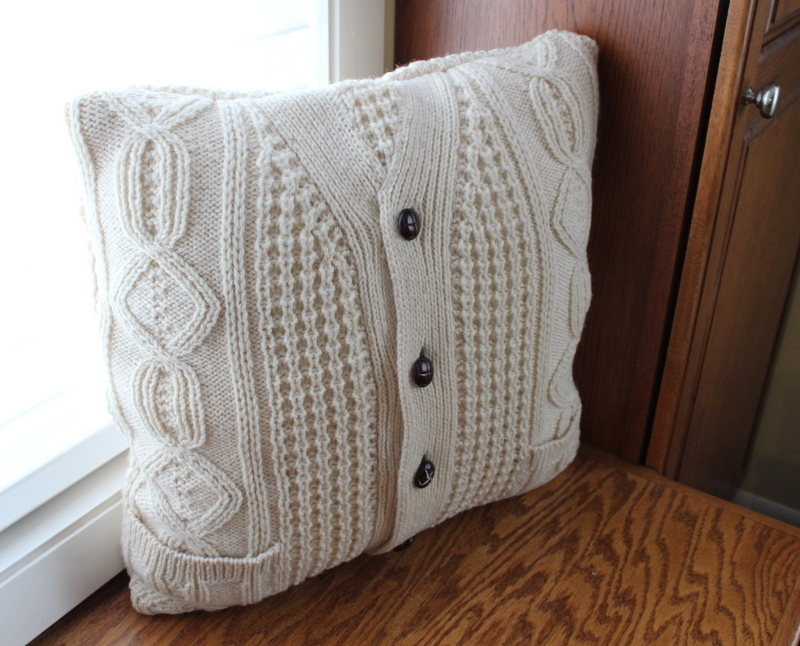 Terrific sweater pillow! 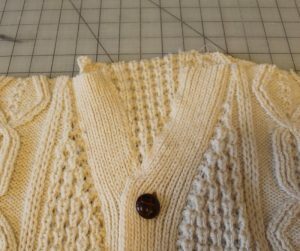 My dad passed recently and I haven’t had the heart to give his favorite sweaters away. This will give those special garments a new and honored place in our home. I’ve made similar pillows using old polo shirts for my son’s room. 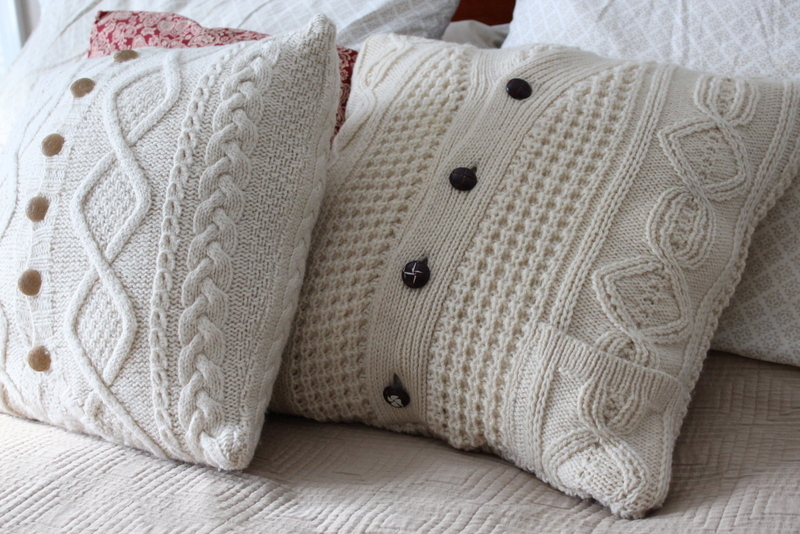 The 3 button style of the pullover make them fun to use as pillows too. And yes, so very easy to make. Polo shirts come is so many colors, they’re perfect for decorating. This Christmas my husband will have been gone for three years but it seems as though it was just last week at times. I was so thrilled to see all of these memory items. My husband’s clothes are exactly where they were three years ago when he died. I wanted to make something for my daughter as well as myself from his clothes. This would create a special keepsake from a particularl favorite shirt he wore a lot or something that she might have given him for a Father’s Day present. Thanks for sharing. I am sorry about your loss. Your daughter and you will find some comfort in these pillows. 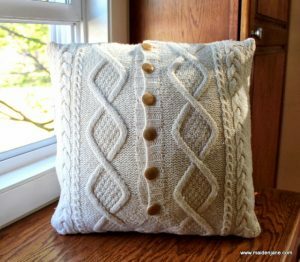 Is it safe to assume (or ignorant) that you would just unbutton the sweater portion to add the pillow form? I realize it’s been a year since the last post, but I wanted to say thanks for the idea. I’ve been holding on to an Irish fisherman’s knit wool sweater my mother made for me years ago. Nearly everyone in the family has at least one of her Irish sweaters in various styles. In my youthful backpacking days of the ’70s, bright green shampoo leaked out onto the back and it never came out. 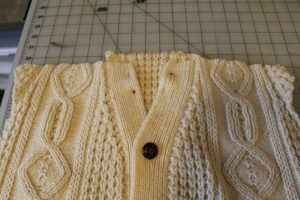 I have not been able to part with the sweater, even after all these years, but I never wore it again after it got spoiled. And now my mum’s been gone from us for 3 years, so it’s especially precious to me. My problem is that it’s not a cardigan. So I’ll have to think of another way to close up an opening… perhaps add buttons on the side? Or an invisible zip? Or a flap on the back? Hi Kathy. I am so glad that you can use your mum’s sweater! I would simply sew it up and leave an opening to turn it inside out and hand stitch it closed. 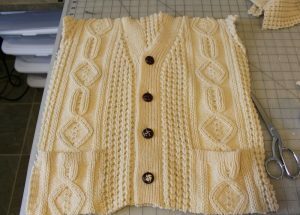 Cannot wait to make this as i have sweater waiting to look and feel comfy. A great idea. I must try it out. I have done something similar with my sons old surf t-shirt. He spilled battery acid on the lower part so l cut that off and recovered an old cushion. It looked the coolest cushion and he still uses it. Thank you! 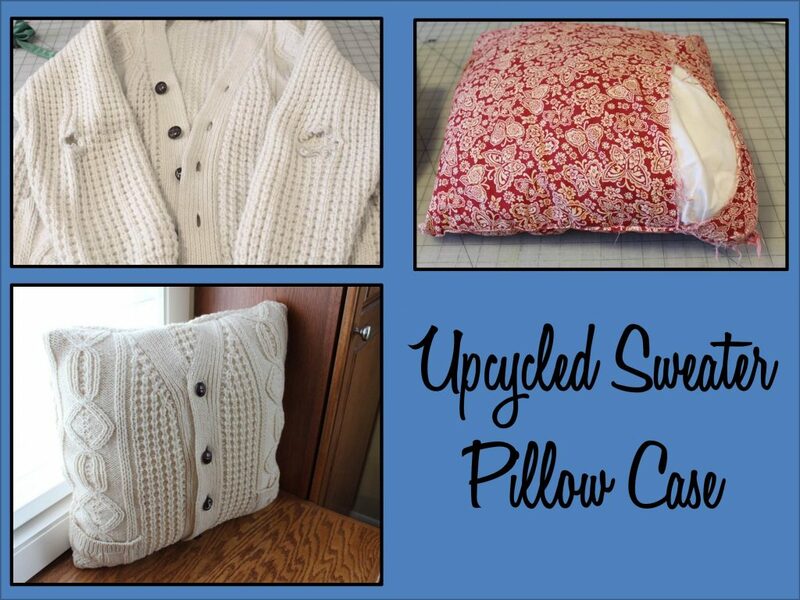 I love re-purposing and your project sounds like a great way to use that old t shirt! I love this idea. I will use it to make couch pillows for Christmas.